Myanmar. The name does not click for many well-traveled friends I know. It is not exactly the kind of country you will find on people’s bucket lists. But having been there just two weeks ago, I have fallen in love with this “Golden Land” of ancient pagodas and friendly smiles. 1) Arresting scenery of temples, landscapes, and people. Shwedagon Pagoda in Yangon City was enough reason for me to go to Myanmar. Rising to 99 meters, this golden pagoda surrounded by ornate temples of gold, green, red, and other colors is a true festival for the eyes. 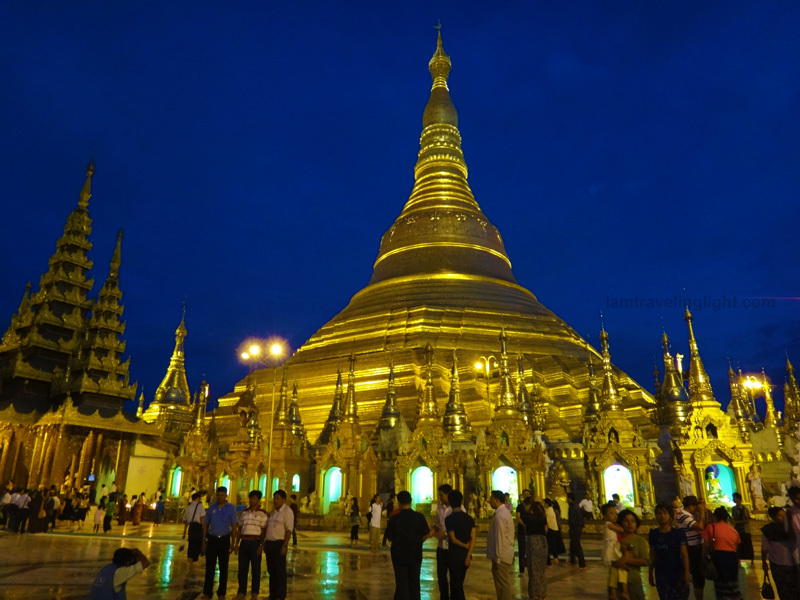 If there is only one temple you will ever visit in Yangon, it should be Shwedagon. 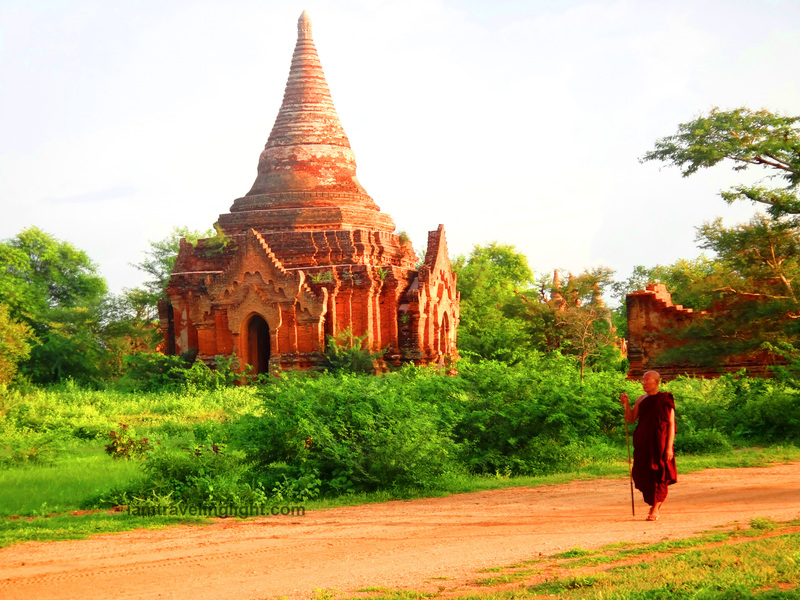 Bagan’s over 2000 temples built on lush green fields is perfect for those who want a more relaxed, rustic atmosphere. Sunrise and sunset are especially magical times, when the earthen temples, standing out from the greenery, look like they are on fire. You can bike here for days and not run out of new things to see – how can you, with over 2000 temples? 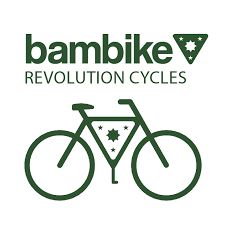 I actually want to go back to Bagan just to bike around and explore it at a more leisurely pace. Mandalay, being the royal capital of Myanmar, has gilt-covered temples and monasteries with the most intricate and detailed wood carvings. 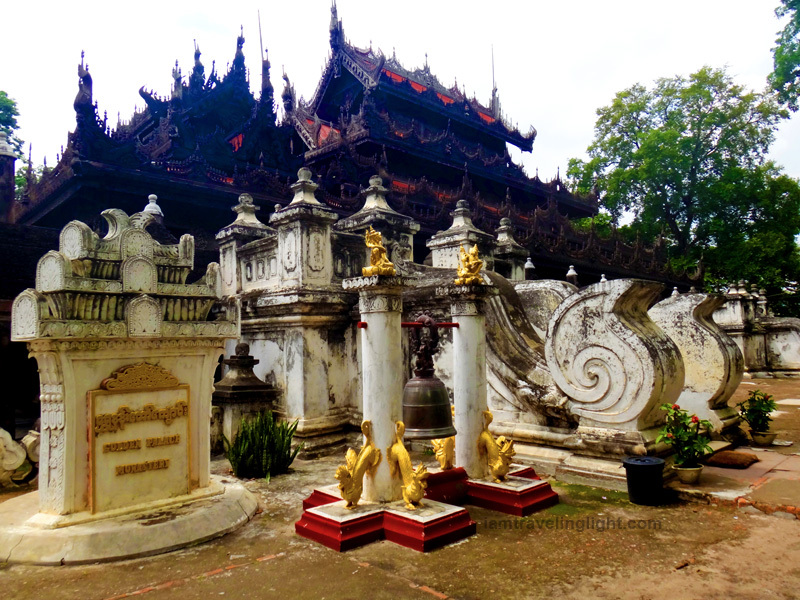 It is also here that you will find Shwenandaw Monastery, the surviving remnant of the original Royal Palace of Myanmar, most of which was unfortunately destroyed during World War II bombings. Even without going inside temples or heritage sites, a walk around Myanmar’s cities reveal some interesting sights. 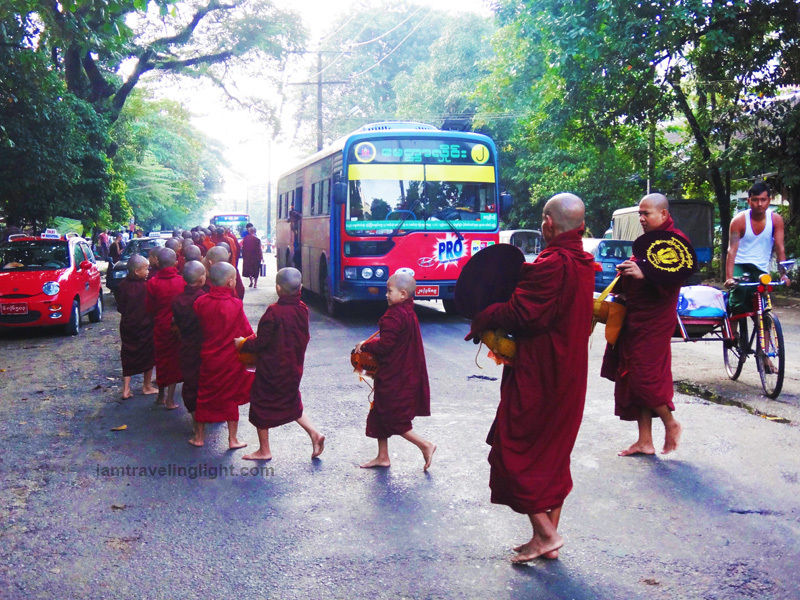 In my walk around Yangon, for example, I saw locals carrying about their daily business on their traditional attire longyi (a cloth wrapped around like a skirt) – some feeding a passel of pigeons – long lines of monks stopping traffic, and of course, pagodas or temples punctuating the cityscape. 2) The people and their warm hospitality. 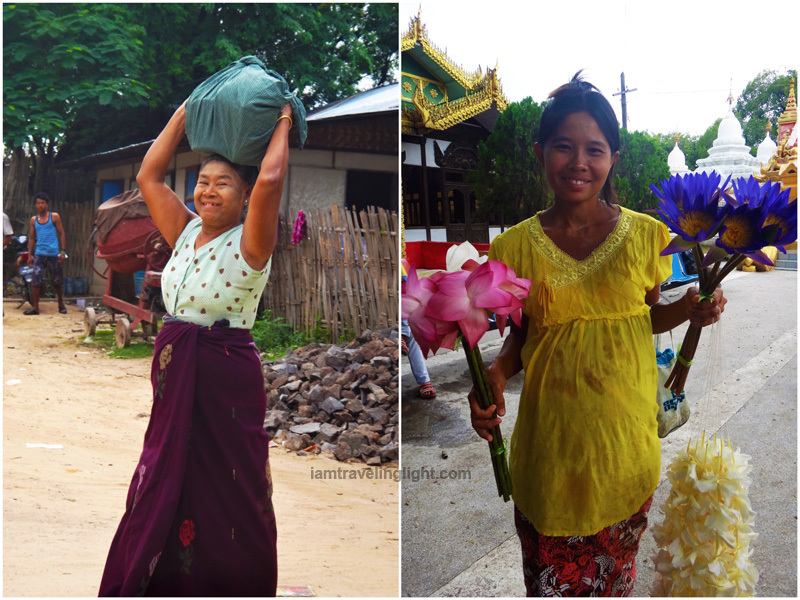 Perhaps I am biased on this, but the people we encountered during our week-long visit in Myanmar made us feel especially welcome and taken care of, often going the extra mile (it was in this country that I really felt what that phrase meant). There was that palm sugar store in Bagan that served us a free snack, and one woman there even painted our faces with thanaka, (Burmese traditional makeup and sunblock) at no charge. There was our van driver in Mandalay who insisted on taking us to as many as temples as possible, at no additional charge. And then there was one of the owners of Mya Thida Hotel in Bagan, who took us to his “special place” to watch the sunset over the pagoda-dotted expanse of greenery. And yes, we were the only people at that temple then. What amazed me was that all this extra mile was given with utmost sincerity and no hidden agenda. It was customer service unlike anything I have ever experienced – or more appropriately, just humble people who want us to experience the beauty of their country. On the streets of Yangon, Bagan, and Mandalay, I often found locals smiling, some greeting, “Mingalabar!” (roughly translated to “hello”). And then there were the genuinely helpful locals who went out of their way to help me despite the language barrier, especially when I was already traveling alone. If there is one thing I don’t want to change about Myanmar even when it becomes really big as a tourist destination, it is the people’s sincerity. This is not to say that there are no scammers or people who overcharge in Myanmar. As with any travel destination, it is best to be alert. 3) Food, glorious food. 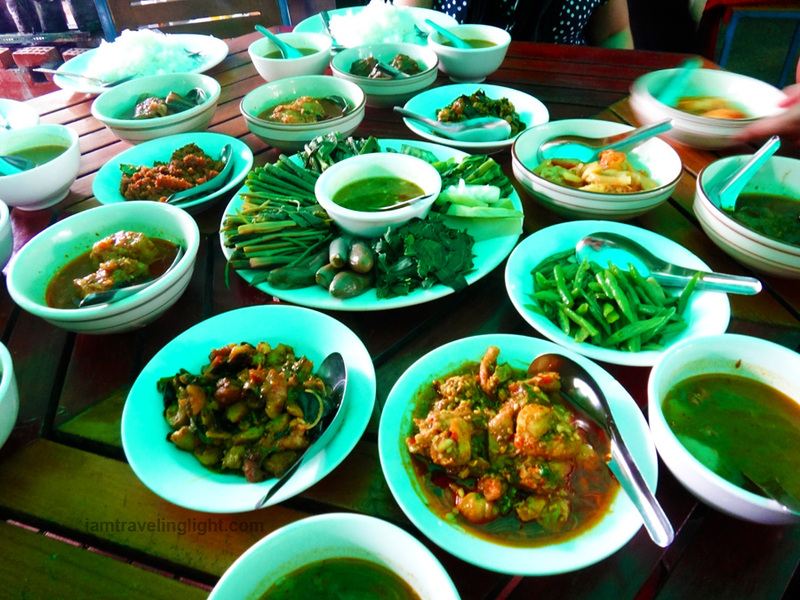 Order a regular set of rice and curry from a typical Burmese restaurant and you will be pleasantly surprised to find yourself served three or more side dishes (plus a big plate or more of fresh vegetables with a salty-spicy dip), offered unlimited rice throughout your dining pleasure, and later, free dessert! And Burmese don’t scrimp on ingredients, either. Whether you are eating at an open-air roadside eatery for 1000 kyat (roughly one dollar), or dining at a restaurant with a finer ambiance, expect the ingredients to be plentiful. Noodles are not just noodles, for example – they are laden with generous portions of meat and vegetables. And the taste – savory spicy oily (sometimes creamy) heaven! Of course, it will still depend on the restaurant you choose. But so far, of the around ten eateries and restaurants I have tried during my visit, I was not disappointed. 4) It is still relatively untouched. Unlike the tourist crowds at say, Cambodia (think hundreds and hundreds of tourists waiting for the sunrise at Angkor Wat), Myanmar is not deluged with tourists – yet. At Bagan, I remember there were only less than ten tourists with us when we watched the sunrise, and Shwedagon Pagoda, even on a weekend, was not overwhelmingly crowded. So, if you find big crowds stressful and just want to relax and unhurriedly enjoy the country’s beauty, the best time to visit is NOW. 5) Tourist-friendly facilities and conveniences are increasing. I read from blogs of travelers who visited Myanmar last year and in the past that Internet is difficult to come by, and is often slow (think dial-up speed), and that there are only a few cafes offering Wi-Fi connection. That might have been the case then, but during our group’s visit two weeks ago, we did not have problems finding Wi-Fi. There was Wi-Fi in our accommodations (including a backpackers’ place I checked into when I traveled solo later), and at most of the restaurants we ate at. Sure, sometimes Internet was slow at our accommodations, but at the restaurants, Internet was quite fast. I was also advised to bring all my spending money – crisp, flawless dollar bills for exchange – as ATMs are hard to come by. Upon arrival at Yangon International Airport, though, I immediately saw a working ATM, and many more later at Shwedagon Pagoda and a few parts in Yangon, and also Mandalay. While ATMs are not as easily accessible compared with other countries’ cities, they are certainly accessible enough. They don’t seem to be too strict with the flawless state of dollars, either. While hotel staff and Shwedagon Pagoda staff refused to accept my tattered one-dollar bills, they accepted my bills with noticeable creases of a few centimeters long or less. Since the military government in Myanmar started relaxing its control, the country has been opening itself up to the rest of the world, and I believe Myanmar’s people are also working to make it more tourist-friendly. excited to visit this place, not now, but next year 🙂 i think cynthia will love the food too: i can see lots of crunchy greens on the 6th photo! Myanmar cuisine is delicious to meat lovers and vegetarians alike. 😉 Enjoy! 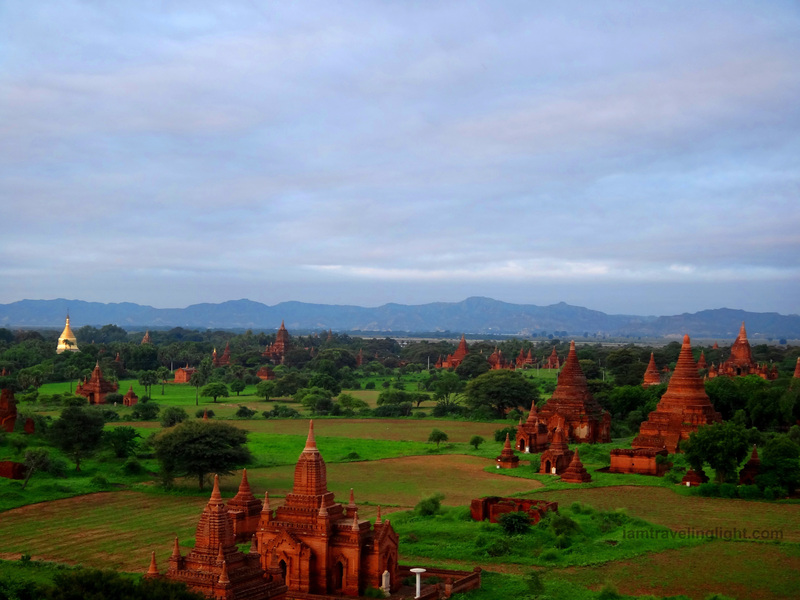 I’ve always been intrigued by Myanmar, particularly because of Bagan. Appreciate this post very much. Btw, are you from the Philippines? If so, what’s the best way to get to Myanmar? Thanks! Hello! Apologies for the late reply as I have been offline for quite some time. I’m not sure if there are better routes, but the one I took is a flight to Kuala Lumpur from Manila (many airlines have this route), then KL to Yangon (AirAsia). Another route a friend took is Manila to Bangkok, then Bangkok to Mandalay (AirAsia). Hope this helps, if you haven’t found this out already. How did you get around the country and was it easy to find lodging that was safe and clean? Thank you and a wonderful post and very helpful.